Brokers Open House, An Exclusive Jazz & Cocktail Party. This is an event you truly do not want to miss. Basking Ridge encompasses almost 5 square miles in Somerset County, surrounded by the equally upscale communities such as Bedminster Township and Bernards Township. The character of this borough is maintained throughout by lush parks and large, luxurious estates. Driving down Liberty Corner Road, about 100 yards up the driveway you will find the meet the magnificent, custom private estate that is 208 Liberty Corner Road. From the moment that you reach the front door, you will be captivated by the exterior of this home; the pillars give off a vibe of elegance and sophistication. Enter through the front doors and into a breath taking two – story grand foyer, marble floors and the timeless spiral staircase. Once inside this luxurious estate, it is your choice which direction you head. Whether it is off to the right where you will enter into the homes private library, or off to the left, where you enter into the elegant formal dining room. The lower level of this home is fully finished and includes a home gym and a bedroom and two full baths…plus so much more! The outdoor space of 208 Liberty features resort-like amenities, take a dip in the heated in- ground pool, or relax in the Jacuzzi. 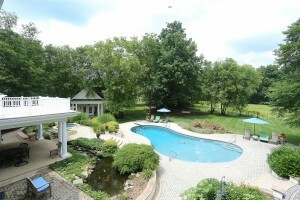 A sprawling patio overlooks a private Koi fish pond, also includes a gazebo, and a fully wired stereo system. There is also a Carriage/Pool House, we could describe it, but you’ll have to come to the Brokers Open to experience the character it adds to the home.